Convert DOCM to JPG raster images online and for free! Run a DOCM to JPG Online Converter or take our Great batch App! Get Total Doc Converter to convert DOC, DOCX, TXT, RTF in batch. Get a more poweful engine to process large files. Total Doc Converter supports DocX (the format of Word 2007 documents). Installed this free Microsoft Office Compatibility Pack to convert DocX files to HTML, PDF, XLS, JPG, TIFF, TXT with Total Doc Converter. Total Doc Converter converts Doc to PDF and allows you to add a digital signature to the final document. Convert and combine several documents into one multi-page file (PDF, DOC, TIFF or a very long TXT file). All done in one go! Total Doc Converter can convert Word 2010 to Word 2003 if you need a file compatible with older Microsoft Word. Have an outdated Microsoft Office 2003? Update all your old files to the new format in one go. Convert Doc files to DocX with our Total Doc Converter. Total Doc Converter allows setting your default font for text files. Total Doc Converter can print out, fax to send to OneNote any file you select. It will also create detailed reports on your Doc files in PDF, XLS, CSV, TXT formats. It's the esiest way to learn how many files you have and their parameters. 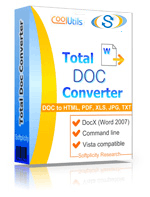 Total Doc Converter has a clear, easy-to-follow interface. You won't get lost in settings! The widest list of supported file types: convert Word, Doc, DocX, DocM, RTF, RVF, or TXT files to RTF, DOCX, XLS, JPEG, PNG, TIFF, HTML, XHTML, PDF, TXT in a batch mode. It's a powerful all-in-one doc converter! Total Doc Converter supports several types of compression for TIFF. If you are at a loss the program will automatically choose the best value. Every document is displayed in Preview panel. You can zoom it or view the document full-sized. Use preview option to quickly find a file. Do you want more order? Total Doc Converter will add page counters or a date to every page of the output files. The app is great for stamping legal bates too! Total Doc Converter can copy original time stamps if you want to keep them. Total Doc Converter offers a lot of additional settings for Doc to PDF conversions. Set user permissions, password-protect your files or sign with a digital signature. Get PDF, PDF/A and non-searchable PDFs. Total Doc Converter can be run via command line (get the ready-to-use command line from GUI). Description DOCM is a new Word-based extension, a Macro-enabled MS Word Open HTML format. Just like DOCX, this format combines XML and ZIP compression algorithms resulting in smaller file size and therefore more convenient sharing and storage. However, DOCM files contain a VB (Visual Basic) programming code � a macro (the “M” in the file name stands for “Macro”), which is potentially dangerous and should be regarded with caution. DOCM files can be opened in Windows 7/8/Vista/XP. If you have downloaded a DOCM file from a source you do not trust, do not open it.